Summary: Quinoa, a plant native to South America, has become a popular food staple due to its high nutritional content. The edible seeds of the quinoa plant are rich in protein, unsaturated fats, and essential vitamins and minerals. Quinoa also contains beneficial polyphenols that may help to reduce the risk of cardiovascular disease and cancer. A recent study identified a number of phenolic compounds in quinoa that have demonstrated anti-cancer activity in preclinical studies. Another component of quinoa, saponins, are used in the clinical setting in combination with chemotherapy to enhance its effectiveness. Quinoa (Chenopodium quinoa), a plant native to the Andean region of South America, is one of the world’s oldest cultivated crops. Although the edible quinoa seed resembles a grain or cereal, it is not a member of the grass family, and is classified as a pseudo-cereal. The popularity of quinoa has grown in recent years due to its high nutritional value, a high concentration of protein and essential amino acids, dietary fiber, unsaturated fats, and various vitamins and minerals. Quinoa is aloso naturally gluten-free, and has emerged as a good alternative in gluten-free diets in people with celiac disease . Additionally, quinoa contains a number of bioactive compounds, including polyphenols, which studies have shown can reduce the risk of cancer and cardiovascular disease. Many of the phenolic substances identified in quinoa, including genistein, quercetin, and kaempferol, have antiangiogenic properties, or the ability to inhibit new blood vessel growth, and also suppress the proliferation of cancer cells. In a recently published study in the Journal of Agricultural and Food Chemistry, Spanish and Italian researchers used sophisticated laboratory techniques to identify and quantify levels of specific phenols in quinoa . In addition to the substances mentioned above, the analysis identified the presence of epigallocatechin, a polyphenol present in green tea that has been demonstrated in preclinical studies to inhibit angiogenesis and cancer cell proliferation, and suppress inflammation. 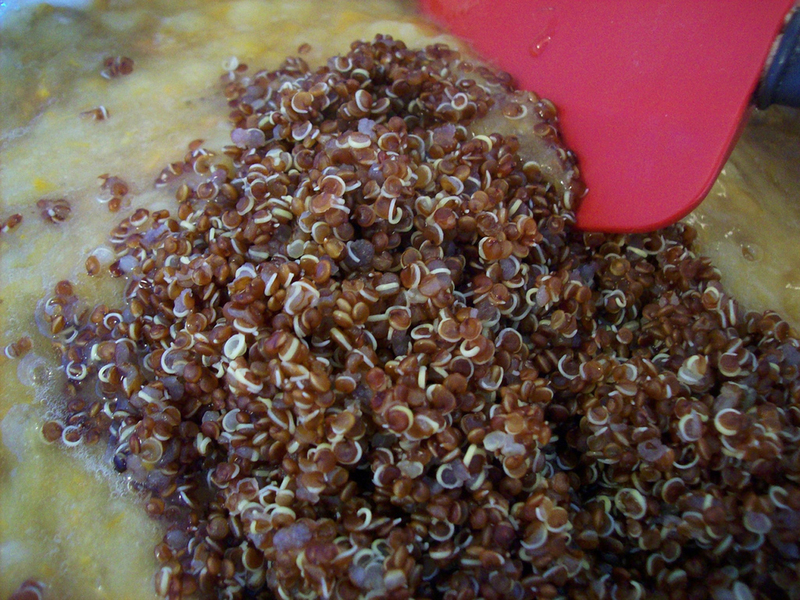 Another interesting component of quinoa are saponins—bitter-tasting chemicals common to many types of plants. While saponins can be mildly toxic, they also have anti-tumor and antiangiogenic activities and are sometimes used as an adjunct to chemotherapy . Future studies are required to determine whether quinoa consumed as part of the diet has chemopreventive efficacy. 1. Gómez-Caravaca AM, et al. Simultaneous determination of phenolic compounds and saponins in quinoa (Chenopodium quinoa Willd) by a liquid chromatography—diode array detection—electrospray ionization—time-of-flight mass spectrometry methodology. J Agric Food Chem 2011;59:10815-10825. 2. Man S, et al. Chemical study and medical application of saponins as anti-cancer agents. Fitoterapia 2010;81:703-714.